Streamer Brushes — get your streamer brushes here! Who woulda thunk that this would become the most popular category of materials here on the site and in store. Thanks to Blane Chocklett and his Game Changer flies. It's also wildly useful on bass, saltwater and just about any streamer pattern! We carry a wide selection of brushes made with a variety of different materials and keep adding more each season as needed. Free shipping on all orders over $25.00 and same day shipping (usually), makes it hard not to buy your brushes from MRO! Don't see what you are looking for here? Be sure to give us a shout, we are always happy to help. 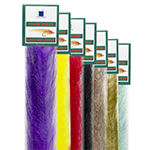 Flash Blend Baitfish Brush - 1"
Flash Blend Baitfish Brush - 2"
Flash Blend Baitfish Brush - 3"
Polar Fiber Streamer Brushes - 3/4"
Polar Fiber Streamer Brushes - 1.5"
Polar Fiber Streamer Brushes - 3"
Sculpting Flash Fiber Brush - 2"